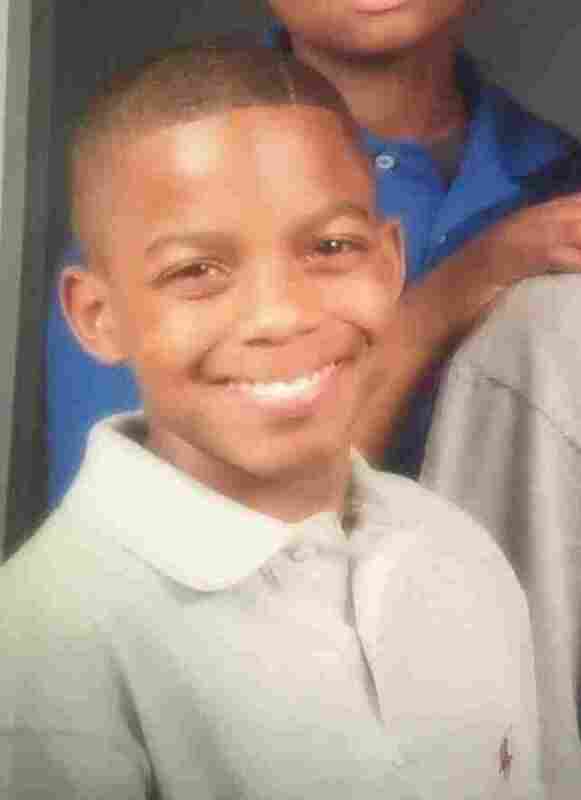 Jordan Edwards, as seen in an undated family photo provided by attorney S. Lee Merritt. By Monday afternoon, however, Haber had retracted that account. “In fact, the car with five teenagers inside was moving forward, not backward, and away from the officers, not toward them. There was no altercation, known or otherwise. “Nevertheless one of officers fired a rifle multiple times into the passenger window, killing young Jordan Edwards. None of the teens were carrying weapons, nor were they drunk. The officer, who remains unnamed, has been placed on administrative leave. Both the Dallas County Sheriff’s Department and the Dallas County district attorney’s public integrity unit are investigating the shooting. “We offer our sincere condolences to Jordan’s family and will continue to keep them in our thoughts and prayers as we move forward expeditiously, with a commitment to justice and transparency,” District Attorney Faith Johnson’s office said in a statement Monday. The attorney for Edwards’ family, Lee Merritt, said at a news conference Monday that the teen’s parents will continue to push for the officer to be arrested and charged. People carry a large Puerto Rican flag as they protest looming austerity measures amid an economic crisis in San Juan, Puerto Rico on Monday. 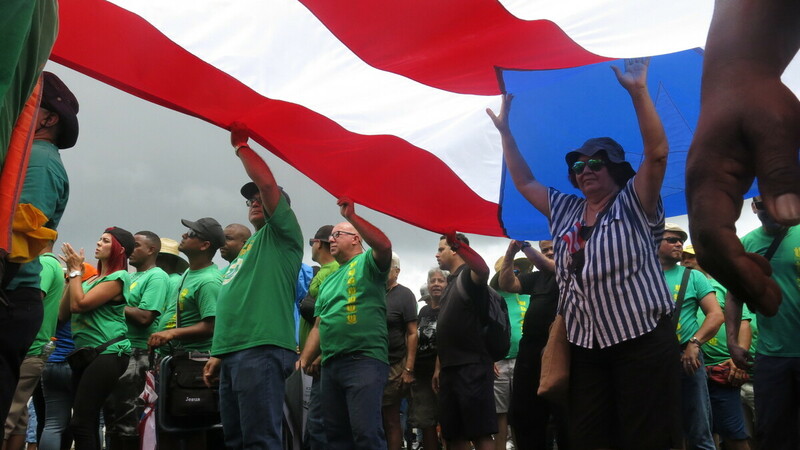 The May Day demonstrations come as the island faces a Monday deadline for reaching a deal on debt payments, or entering bankruptcy-like proceedings. After nearly two years of missed payments and delayed actions, Puerto Rico is bumping up against another deadline as it tries to grapple with tens of billions of dollars of debt. One proposal for partial repayment of the debt was rejected over the weekend. Another option is for the island to essentially declare bankruptcy, through a process created specifically for Puerto Rico. After midnight on Monday, if some sort of deal has not been struck, the U.S. territory will be fair game for lawsuits by its creditors. Meanwhile, thousands of protesters marched in San Juan on Monday, in May Day protests fueled by anger over the out-of-control-debt and resulting cuts in services. The island is preparing to “cut public employee benefits, increase tax revenue, hike water rates and privatize government operations, among other things,” The Associated Press reports. The unpopular steps are driven by the same oversight board that has been negotiating the future of Puerto Rico’s debt payments. The debt was born out of a 25-year economic disaster that left the territory running a deficit year after year, taking out loans just to keep the lights on. Economic woes drove residents off the island and to the mainland, which worsened the cash-flow problem. In 2015, the island’s governor declared the debt, more than $70 billion, “unpayable.” Puerto Rico couldn’t afford to make its loan payments and also pay for basic services like police, schools and hospitals. The two years that followed were marked by defaults on loan payments, budget cuts and tax hikes. Austerity measures meant residents of Puerto Rico — who are U.S. citizens — experienced slashes in government services. If Puerto Rico were a municipality in the U.S., it would be able to declare Chapter 9 bankruptcy — that’s what cities like Detroit have done when their debts became unmanageable. But as a territory, it doesn’t have that option. In June 2016, Congress passed a law, PROMESA, that created a special oversight board to tackle Puerto Rico’s debt problem. The board took some control away from local government, which has prompted protests from Puerto Ricans, who say the board — which has been facilitating negotiations between Puerto Rico and its creditors — is valuing investors’ interests over those of the islanders. But the oversight board also gave Puerto Rico a new option for handling its debt: If voluntary talks fail, the board has the ability to initiate a mandatory, court-supervised debt restructuring process. PROMESA doesn’t call this “bankruptcy,” and it’s not identical to Chapter 9. But the underlying principles are the same. “It mirrors conventional bankruptcy processes that are ordered and arbitrated through a court system,” says Eric LeCompte, the executive director of Jubilee USA Networks, a religious development organization that supports debt relief and debt forgiveness. The “Title III” process, as it’s called in PROMESA, allows Puerto Rico to address all of its debts at once, in a comprehensive process — which even Chapter 9 doesn’t allow, LeCompte says. It’s essentially a bankruptcy process custom-built for Puerto Rico’s debt crisis. The other option has always been to strike a deal without involving the courts. Late on Friday, Puerto Rico’s governor made an offer to the island’s creditors that would have done just that. Bloomberg reports that the proposal would have paid as much as 77 cents on the dollar to some creditors, and as little as 39 cents on the dollar. That was a worse deal than the previous governor had suggested to creditors, the Wall Street Journal reports. Bondholders rejected the idea, sending the debt back to the negotiating table over the weekend. These negotiations have been dragging on for years, but a new deadline loomed over the latest talks. Puerto Rico has been protected from litigation through a temporary stay, designed to buy time for talks, that expires at midnight on Monday. That stay has been extended before, but Congress has made no move to offer a reprieve this time. Former first lady Michelle Obama attended the presentation of “Let Girls Learn” at Matadero cultural center last June in Madrid, Spain. Meanwhile, CNN reported that the Trump White House will not continue the Let Girls Learn program in its current form. The initiative aims to provide educational opportunities for young women in developing countries. The school nutrition standards have long been a source of controversy, making them a more likely target of the current administration. Reports about the Let Girls Learn program, which the Peace Corps oversees, are perhaps more surprising. 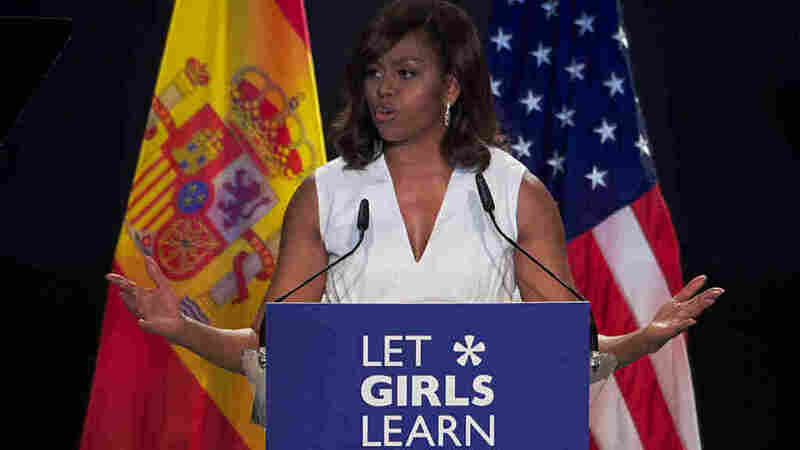 The first lady made the initiative a priority of her husband’s final years in office, traveling in 2016 to Liberia and Morocco with her daughters, Malia and Sasha, and actresses Meryl Streep and Freida Pinto. NPR’s Allison Aubrey reports that the School Nutrition Association, which represents school food administrators, has been pushing for the changes. The fight over school lunches has lasted years. Even after the Healthy, Hunger-Free Kids Act of 2010 took effect, Michelle Obama continued to have to defend its importance, as NPR’s Tamara Keith reported in 2014. In 2016 the Senate settled on a compromise that would keep most of the new standards in place, including requiring to schools to serve more fruits and vegetables along with the planned reductions in sodium and increase in whole grains. Authorities in South Sudan detained Eyder Peralta, NPR’s correspondent in East Africa, for roughly four days before releasing him Monday morning. Peralta and his South Sudanese assistant were first placed in custody in the city of Juba on Friday, and they were held for three nights. It remains unclear why they were detained. 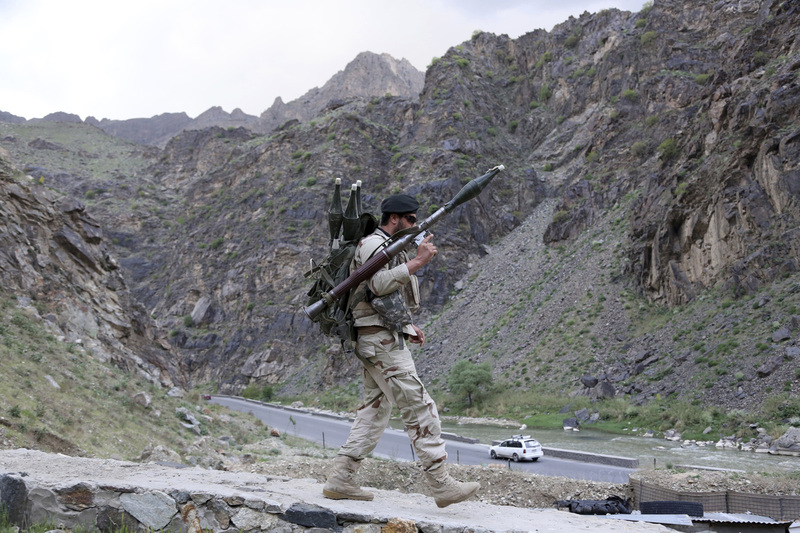 An Afghan soldier walks at a checkpoint last month on the outskirts of Kabul, Afghanistan. As the U.S. considers sending more troops to Afghanistan and reviews its current strategy there, a new report from a U.S. government watchdog paints a bleak picture of the country’s security and corruption issues. The findings were detailed in the latest quarterly report from the Special Inspector General for Afghanistan Reconstruction, or SIGAR — a military agency set up by Congress that audits U.S. spending in Afghanistan. Conflict-related civilian casualties reached their highest levels since the U.N. began documenting them in 2009, the report states, with 3,498 civilians killed and 7,920 injured. And the casualty toll within the ranks of the ANDSF “continued to be shockingly high,” the report says, with 807 killed within the first six weeks of the year. That figure does not include the massive Taliban-claimed attack at a military base in the city of Mazar-i-Sharif that killed at least 100 Afghan soldiers. “The ANDSF faces many problems: unsustainable casualties, temporary losses of provincial and district centers, weakness in logistics and other functions, illiteracy in the ranks, often corrupt or ineffective leadership, and over-reliance on highly trained special forces for routine missions,” the report says. U.S. Secretary of Defense James Mattis, who visited the country last week, has said that the Trump administration is reviewing U.S. policy toward Afghanistan. 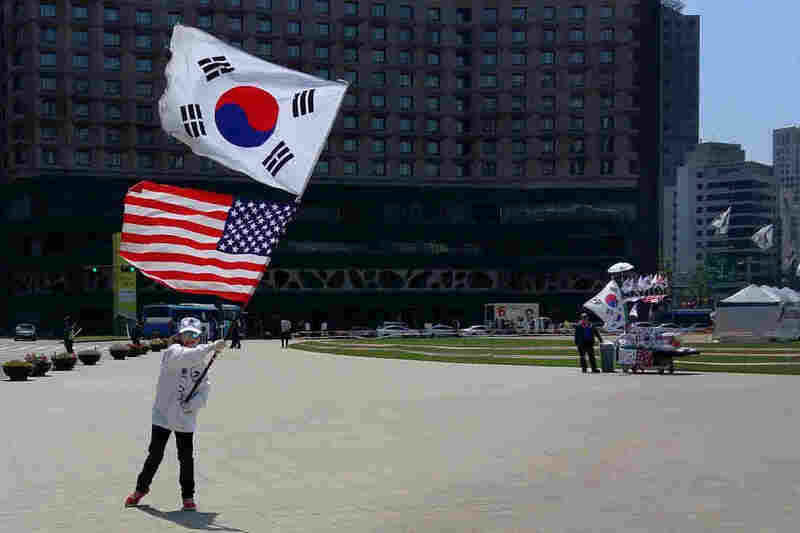 A demonstrator waves U.S. and South Korean flags together, at a pro-U.S. rally in front of Seoul’s City Hall on Saturday. At a pro-U.S. rally in central Seoul over the weekend, supporters of impeached South Korean President Park Geun-hye chanted for the destruction of their enemy, North Korea. They’ve formed an encampment outside City Hall, where they express support for Park and the U.S., and criticize left-wing politicians. Park was removed from office in March, a first in South Korea’s history. She goes on trial Tuesday for corruption, and faces life in prison if convicted. On May 9, there’s a presidential election to replace her. At the polls, South Koreans are expected to punish Park’s fellow conservatives, and elect a liberal instead. The vote also has become a referendum on U.S. relations — about how close South Koreans want to be with the United States. Park is an icon of South Korea’s conservative establishment. Her backers tend to be older, Christian, conservative and pro-U.S. — people who lived through the 1950-’53 Korean War as children. 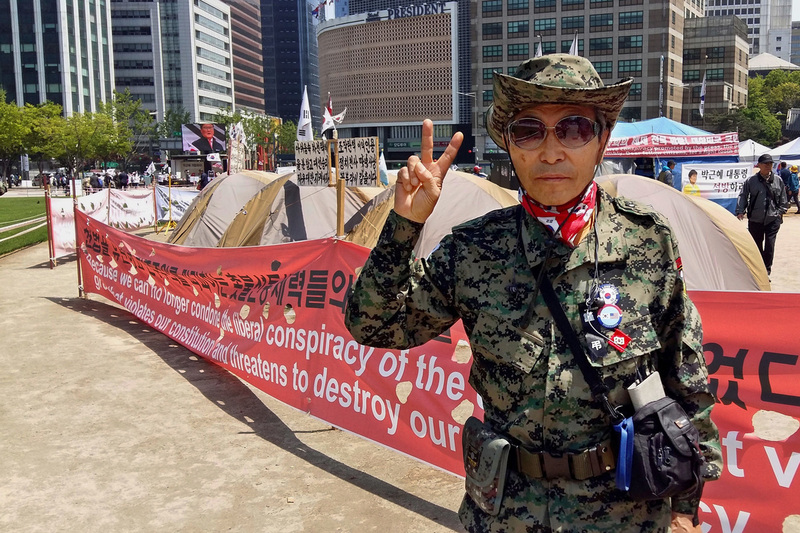 Lee Seung-won, 74, considers himself a pro-U.S. conservative, and he believes the ousted South Korean president, Park Geun-hye, was unfairly treated. Park goes on trial Tuesday for corruption. An election to replace her will be held May 9. A liberal, however, is leading in the polls: Moon Jae-in, a human rights lawyer who wants dialogue with North Korea, and possibly cooler relations with Washington. Protesters clashed with riot police last week in Seongju, a rural southeastern region of South Korea, where the U.S. military is installing a defense system designed to shoot down North Korean missiles. An increasing number of South Koreans are opposed to it. The presidential front-runner Moon vows to renegotiate the deal. Moon’s rallies tend to draw support from younger South Koreans who’ve grown up in a prosperous, peaceful country. They worry less about war, and more about youth unemployment and corruption. Aside from ex-President Park, the head of Samsung, the country’s biggest company, is also on trial for corruption. Park is accused of conspiring with a childhood friend to collect tens of millions of dollars in bribes from big companies. Charged with bribery, coercion and abuse of power, she faces life in prison if convicted. Her fall from power has many South Koreans rethinking Park’s policies, including the traditional, steadfast alliance with the U.S., which began in the Korean War and its aftermath, when South Korea was a much poorer nation. Choi says she always considered herself pro-U.S., but she’s worried about relations under President Trump. In recent days, Trump has said he may scrap a free trade agreement with South Korea, and has threatened to make Seoul pay for the missile defense system the U.S. military is installing. Trump also has said he’s thinking about preemptive military action against Pyongyang. North Korea may not understand either, and that may explain why it has not conducted a sixth nuclear test, as has been expected. It has previously set off five underground nuclear explosions, including two last year. On Monday, North Korea said it’s bolstering its nuclear program at “maximum” speed — and that only its “Supreme Leader,” Kim Jong Un, will decide when the next step will come. Writers occupy a critical place in television production. It’s much different from the movies. In movies, it’s the director whose vision is executed, who controls the tone and pace. But in television, plots, characters, themes, even the vibe, all get established in the writers room. Back in 2015, Shonda Rhimes, arguably the most powerful woman in television, described herself as first a writer in an interview on WHYY’s Fresh Air. “Just?” responded host Terry Gross in some disbelief. “Writers literally run TV shows,” agrees James Poniewozik, chief TV critic for The New York Times. He says “peak TV” — an era where more than 450 scripted series were produced this season alone — would be impossible without hundreds of writers rooms filled with people bouncing ideas off each other, polishing each others’ work — and serving the creator’s singular voice. The collective voice of the writers room is especially crucial with a network comedy like ABC’s Black-ish that might produce as many as 25 episodes a season. But shorter series are increasingly common on streaming, cable and even network shows. Stranger Things, on Netflix, had only eight episodes. That translates to less money for writers, who are paid per episode. According to the Writers Guild of America, writers’ median salaries have actually dropped over the past two years. Poniewozik was hopeful this strike would be averted. 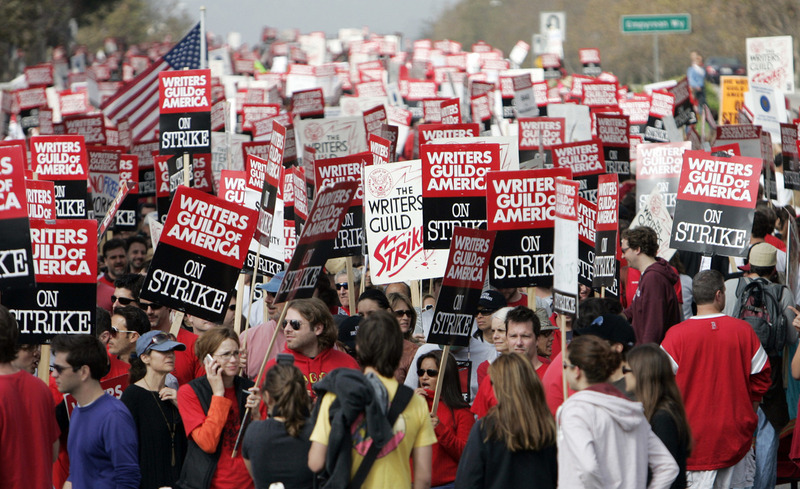 As happy as he is that the writers and studios have found common ground, he could not help but think about a strike’s potential personal upside. “I might at least get caught up on a lot of my backlog,” he said wryly. All those shows we don’t have time to watch might be ones we can finally get around to. Poniewozik still plans to check out the Showtime drama Billions and if — god forbid — the strikes drags on and on — he points out there are at least four decades worth of the show Dr. Who. 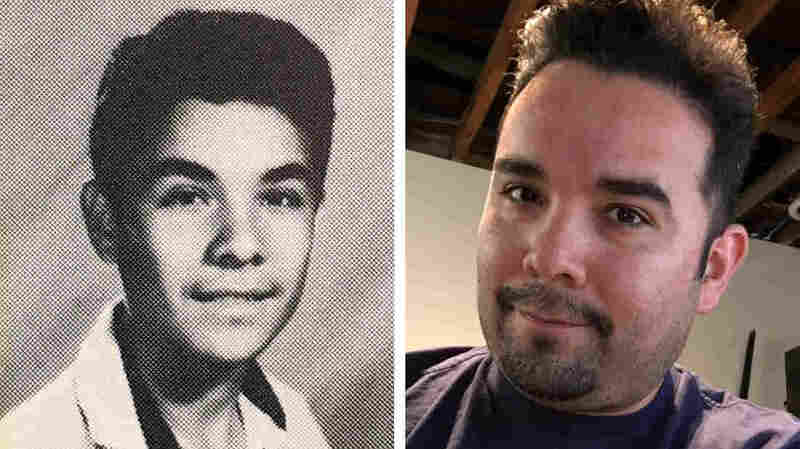 Gilbert Monterrosa was 15 years old (left, from his high school yearbook in 1992) during the Los Angeles Riots. He and some friends decided to loot a Fedco department store where he found something unexpected — Nirvana’s album, Nevermind. People went into stores and just walked out with stuff. Some people stole vital things such as food and baby formula because they didn’t know how long the riots would last. Others stole booze and cigarettes. Still others dared to carry mattresses and giant TVs home on their backs — and they weren’t stopped by anyone. Monterrosa was 15 at the time — a sophomore at James A. Foshay Junior High, now known as James A. Foshay Learning Center. He lived with his mom and two younger sisters in what was then known as South Central Los Angeles, and they had immigrated from El Salvador. Monterrosa says he and his siblings weren’t allowed to watch TV after 5 p.m., so when the riots started on April 29, they didn’t know anything had happened. They just went to bed like they always did. It wasn’t until the next day when Monterrosa was walking to school and bumped into his friend Luce and her mom that he first realized something was going on. Luce’s mom insisted Monterrosa turn around and go back home. She said she would call his mom and explain the whole thing. As they walked back, Luce explained. But when Monterrosa got home and turned on the TV — as thousands of others would do around the country — he saw exactly that. As he watched TV for the next four hours, he saw breaking news video of his neighborhood on fire, and people breaking into stores across town and stealing things. It wasn’t long before two of Monterrosa’s friends came over and insisted they go out and steal too. At first, he did not want to go. That was, until a neighbor played on Monterrosa’s major weakness. So when the neighbor, Eduardo, questioned him, Monterrosa caved. Monterrosa and his friends piled into the car and drove to the nearest Fedco department store on the corner of La Cienega and Rodeo streets. The Fedco no longer stands on this intersection — it has now been replaced by a Target — but back then, Fedco was similar to a Costco. It was a major wholesale warehouse with groceries and all kinds of goods. When Monterrosa and his friends arrived, they discovered items all over the floor. 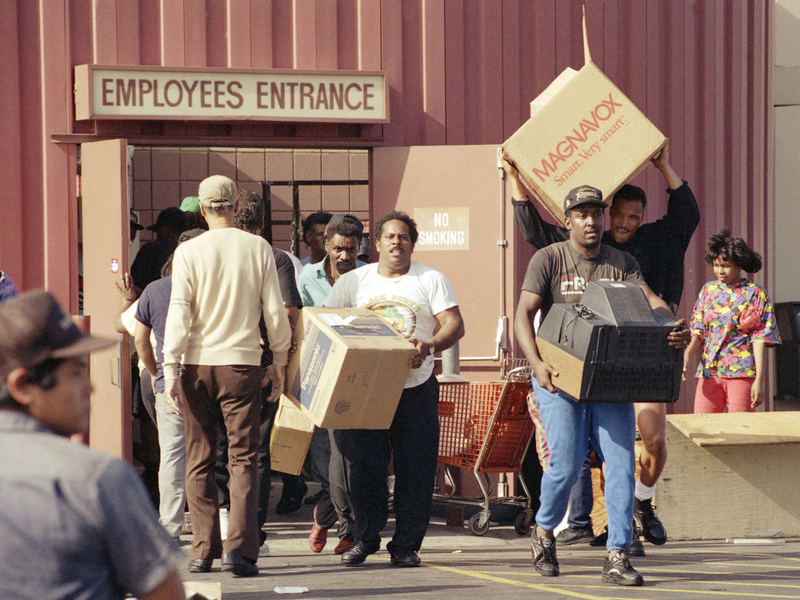 Looters carry televisions out of a Fedco Department Store at La Cienega Boulevard and Rodeo in Los Angeles on May 1, 1992, during the second day of rioting in the city. Monterrosa remembers being pretty nervous, but then he started to think that there was one thing he might really want, something his mom could never afford — a boombox. That’s because Monterrosa was really into music. So Monterrosa went inside the Fedco, grabbed a boombox and noticed something else among the slew of items on the floor. The albumwas Nevermind by Nirvana. Monterossa snuck back home with the album and boombox. He waited for his mom to go to bed, put on headphones, hit play — and heard Nirvana for the first time. That CD got Monterrosa into a bunch of other music — things he’d never heard before. It was right around this time that Monterrosa’s mom decided to move to a new neighborhood — Silver Lake, which is on the east side of LA — and he started going to a new school. And because he was into grunge — Nirvana, Pearl Jam, flannel shirts — he started hanging out with the other grunge dudes — dudes who were into editing videos and doing graphic design. It was unreal. It was like opening an entire world of music to me. … And in my mind’s eye I could picture the riots as I was listening to “Smells Like Teen Spirit.” And it just became the soundtrack of that day. Monterrosa says if he hadn’t changed his music and his clothes, at the same time he changed his neighborhood, he probably would have ended up getting in trouble, like his other friends back in the old neighborhood. It wasn’t all easy in the new school. Monterrosa eventually dropped out. But then he got his GED, and now he works in IT for a security company that allows you to monitor your home through your smart phone. He’s married and has a little boy. His mom is retired, and he and his sisters take care of her. Twenty five years ago, Monterrossa stole some stuff during the LA riots. He did a bad thing that day, but in a way, it turned out to be a good thing. Driving around LA, he says he still thinks about how that album changed his life. He still has the CD. NPR’s Anjuli Sastry produced and Melissa Gray edited All Things Considered‘s series of reports on the 25th anniversary of the Los Angeles riots. Close-up of tzoallis being made during a summer nutrition workshop held by Puente a la Salud, a group based in Oaxaca, Mexico, that is helping to push an amaranth comeback. 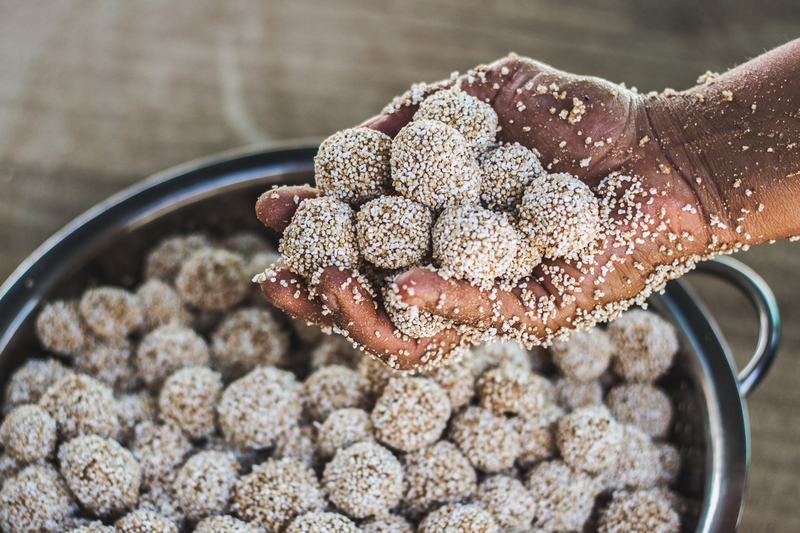 An ancient Aztec staple, tzoallis are made of amaranth and corn flour, agave honey and amaranth cereal. 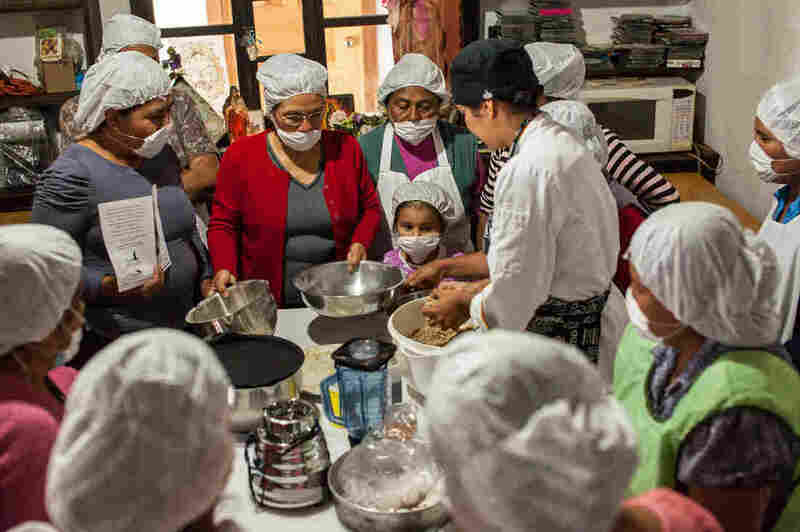 On a sunny Friday morning in San Pablo Huitzo, a town in the Valles Centrales region of Oaxaca, Mexico, a half-dozen women are gathered for a workshop on making alegrías, a healthy, granola bar-like snack made with popped amaranth seeds. Their ingredient list is short: water, honey, raisins, a form of raw cane sugar known as piloncillo, and lime juice. “The trick,” explains the event’s gracious host, Maria Lopez, “is to get the syrup to the right temperature” before adding the tiny orbs of amaranth, each barely bigger than a grain of coarse sand. Gastronomy student Clarissa Moran (center) works with women in microenterprise groups to create new products with amaranth. This could be any chatty gathering of neighborhood cooks in any kitchen in the world, except that in Oaxaca, amaranth is not just a fad ingredient. The ancient indigenous plant is part of a movement to revive native crops and cuisines, and a means of restoring the physical health and economy of their state, one of the poorest in Mexico. The alegría gathering is one of six weekly microenterprise workshops that the nonprofit Puente a la Salud Comunitaria (Bridge to Community Health) holds with 25 different groups in Oaxaca. Founded in 2003 by two American volunteers in Oaxaca seeking a solution to the high rate of birth defects and childhood malnutrition in rural areas, Puente quickly hit on the idea of reintroducing amaranth into the local diet, explains Pete Noll, the organization’s executive director. 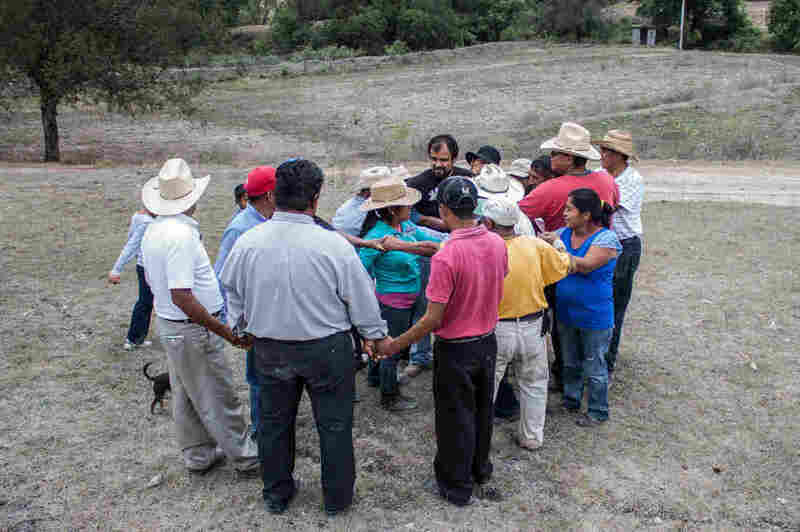 Farmers participate in a trust-building exercise at an organic fertilizer workshop in the Mixteca region of Oaxaca, Mexico. Most of Puente’s farmer partners practice what’s known as agroecological farming — which prizes maintaining biodiversity — or are “in transition” to these methods. High in protein and other nutrients, amaranth is also drought-resistant and profitable, netting local farmers three to five times the profit of other locally grown grain crops. Puente soon began working with small farmers to strengthen local economies through the sustainable cultivation of amaranth, known as amaranto in Spanish. As national obesity rates rose precipitously — Mexico has surpassed the U.S. in the number of overweight adults — Puente took on fighting both malnutrition and obesity. To date, the organization has worked with 6,000 families in over 80 communities to help incorporate amaranth and other healthy foods into their diet. Alegrías made by microenterprise group members of the Central Valleys Amaranth Farmers Cooperative, for sale at an Amaranth Day event in Etla, Oaxaca. In ancient Mesoamerica amaranth was known as huautli, meaning “the smallest giver of life,” and was grown in large quantities similar to that of maize. When the Spanish arrived in the 16th century, amaranth all but disappeared from the native diet. No one knows for sure why. One theory holds that the edible sculptures of Aztec deities made of amaranth, corn and honey — and perhaps laced with human blood — were a pagan threat to Spanish Catholicism. Back at the Lopez household, after the alegría ingredientshave been mixed, the women spread the mixture on a sheet of buttered paper held in a wooden frame, cut it into squares and taste the final product. The verdict: universal thumbs up. The next steps, explains Hope Bigda-Peyton, Puente’s director of development and sustainability, will be for the group to figure out costs, pricing and profit margins. 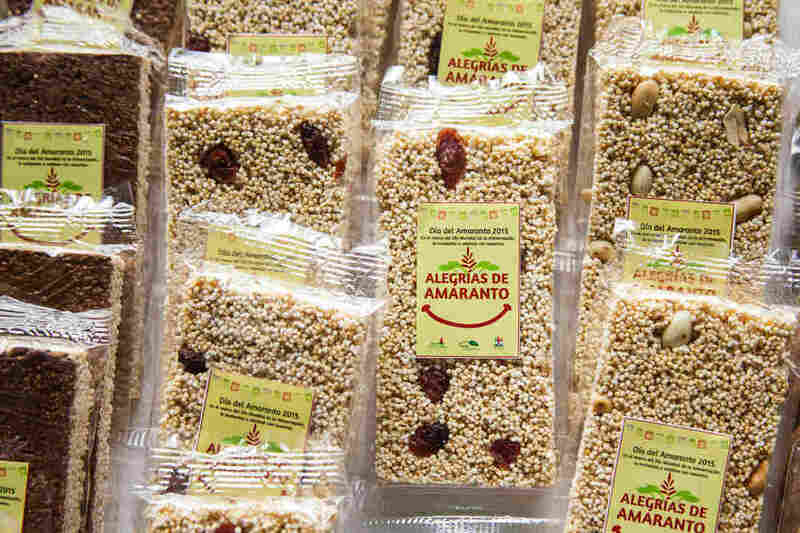 Once they’ve developed their packaging and logo, they can sell their alegrías at local markets and restaurants, or at the two amaranth specialty shops that Puente operates. (Left) Farmer Adolfo Lopez of San Andrés Zautla, Oaxaca, is an amaranth grain and leaf producer. (Right) The amaranth varietal Nutrisol grows in a field in Mixteca Alta, Oaxaca. Not far from where Lopez lives, in the town of Suchilquitongo, tender young amaranth leaves sprout between rows of corn on Minerva Cruz’s farm. One of close to 250 farmers that Puente works with, Cruz is in her third year of cultivating amaranth. “It’s a very noble plant and it has a lot of traditional value. That’s what caught my attention,” she explains. Cruz has lent her farm to Puente for five years to serve as an amaranth processing center. Thanks to a federal grant, the farm recently got prototype machines that thresh and clean the plant’s seeds, which has vastly increased efficiency. It “is a really big step [forward] for Puente,” Noll says. In the brick warehouse adjacent to the machines, Gerardo Lopez, head of Puente’s agricultural extension program, shows how each bag of amaranth seeds is carefully labeled to indicate the varietal it contains and how it was grown. Most of Puente’s farmer partners practice what’s known as agroecological farming — which prizes maintaining biodiversity — or are “in transition” to these methods. This amaranth-based, open-faced tlayuda is typical of the Mixteca region of Oaxaca. Amaranth cereal sprinkled on fruit, like watermelon, is a common way of consuming amaranth in Mexico. Farmers like Cruz who grow amaranth have also developed a repertoire of recipes for the plant. Although the seed, flour and leaves of the bushy plant can all be consumed, cereal (the popped seeds) is the most commonly used form in Mexico. Cruz’s mother likes to add the leaves to water and blend them with lime peel to make an agua fresca. Last summer, to promote the use of amaranth in cooking, Puente partnered with well-known Oaxaca City chefs to create new dishes featuring amaranth. Pilar Cabrera of La Olla created an amaranth leaf and grain salad, amaranth sweet bread, breaded amaranth chicken and an amaranth smoothie. Rodolfo Castellanos of Origen created a hamburger on an amaranth bun and a chocolate cake topped with amaranth cereal and red plum ice cream. Puente’s farmer network has so far exported to only one source outside the country, Toronto’s ChocoSol Traders. 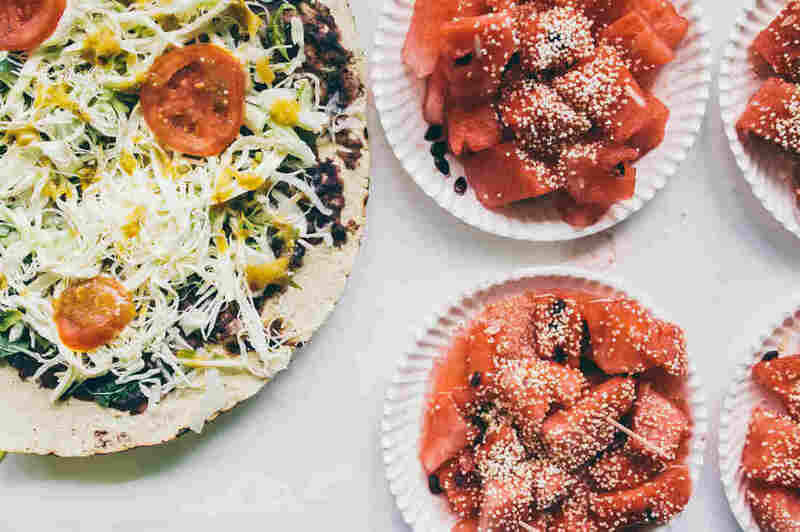 There, founder Michael Sacco and chef Chrystal Porter are perfecting a recipe for a “complete-protein tortilla,” made with amaranth, chia seeds and maize. At Las Quinces Letras in Oaxaca City, chef/owner Celia Florián has hosted amaranth cooking demonstrations by women farmers. She also likes to highlight amaranth and other traditional ingredients prepared in healthy and delicious ways, like her sublimely refreshing agua fresca, filled with strands of the chilacayote squash and its seeds, pilonicillo, bits of lime peel and popped amaranth seeds. Another favorite dish involves blanching amaranth leaves in hot water, squeezing them dry, coating them with beaten egg, breading and frying them. The dish is served with a salsa of pumpkin seeds, or in soup. “We encourage water over soda at the restaurant,” says Florián. “Gradually people’s mindsets are changing” to healthier behaviors. 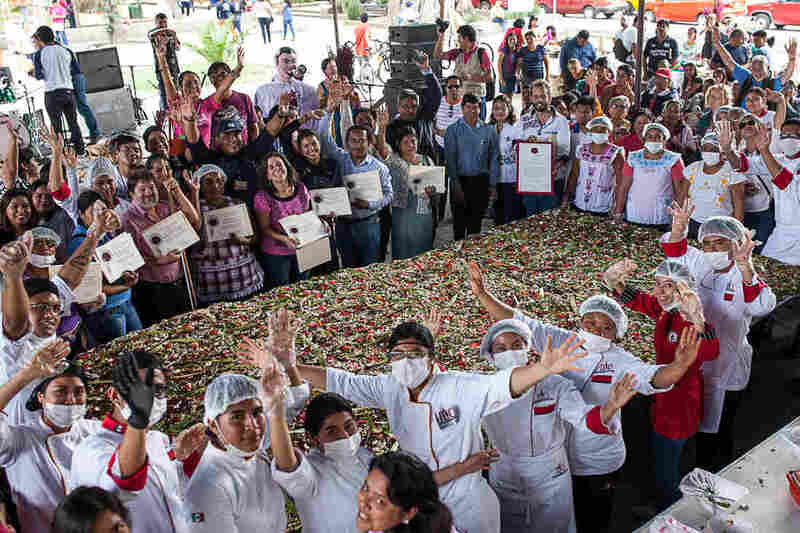 In 2016 Puente staffers and volunteers made a 12-meter-square tlayuda, incorporating amaranth flour, cereal, seeds or leaves in every layer – the biggest ever of its kind, according to the National Group for Amaranth Promotion in Mexico. Trilling has taught some of these recipes at her school, and incorporates fresh amaranth in the summer months as part of her staff breakfast with hard-boiled eggs. “Especially during the amaranth appreciation campaign,” she adds, “people got excited” about the idea of using amaranth as an alternative to granola, in crepes, and in wafers Trilling makes with her students with amaranth flour and coconut. If all these delicious uses are not enough to convince Oaxacans to consume more amaranth, Puente has another enticement up its sleeve. Every October, on “Amaranth Day,” it sponsors the making of a giant tlayuda, a popular street food made by topping a corn tortilla with beans, cheese and chopped cabbage. In 2016 Puente made a 12-meter-square tlayuda, incorporating amaranth flour, cereal, seeds or leaves in every layer — from the tortilla dough to the topping of toasted grasshopper, avocado, radish and salsa. 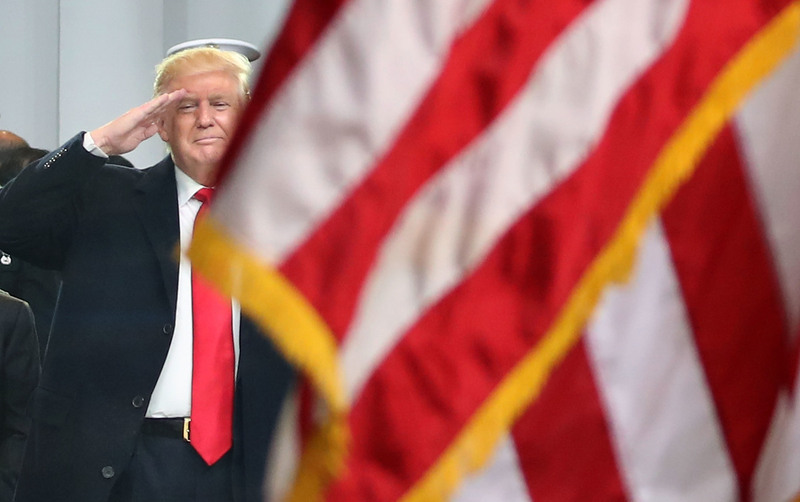 President Trump, seen saluting an American flag during his inaugural parade, issued a statement in honor of Loyalty Day on May 1, as many presidents have before him. Trump’s mention of ISIS may seem unusual in a proclamation for a day meant to highlight national pride and American values, but it is part of a long tradition of presidents (or their staff who write the proclamations) tying this little-known holiday to the threats of the time and bringing their own views to the idea of loyalty. Despite some initial alarm on Twitter, Loyalty Day is not unique to President Trump. In fact, it’s been around for decades. From the Government Printing Office, the law passed in 1958 annually designating May 1 as Loyalty Day. And since then each president has issued proclamations to mark Loyalty Day on May 1 each year, and those proclamations have been vastly different, reflecting each president’s own definition of loyalty and what should be emphasized. In his first Loyalty Day proclamation, President Dwight Eisenhower referred to an “unswerving devotion” to the liberties enshrined in the Constitution. Four days before the botched invasion of Cuba known as the Bay of Pigs in April 1961, President Kennedy’s Loyalty Day proclamation emphasized standing up to totalitarianism. Kennedy’s 1963 Loyalty Day proclamation was further colored by the Cold War footing of the nation. “Understandably, our people avoid ostentatious displays of patriotic fervor. Nevertheless, in these trying times, when international forces are attempting to undermine and destroy our form of free government and our way of life, it is entirely fitting and proper and in the national interest to set aside a special day each year on which to express our unceasing devotion and loyalty to this Nation,” the proclamation read. In 1967, President Lyndon Johnson began his Loyalty Day proclamation, describing the anti-communist history of the day. “May 1st, in some parts of the world, is marked by demonstrations in support of totalitarian party dictatorships. Since 1959, we in the United States have celebrated it as ‘Loyalty Day,’ a time when we are asked to recall the ideals which have nourished our free society. “To an American, then, loyalty is not automatic acceptance of authority but consecration to the principles of a free society. “It imposes restraints on the majority and on minorities alike. The majority must have the right to act, but its actions must follow the course of due process. At the time, American service members were dying in increasing numbers in the Vietnam War and the anti-war movement in the U.S. was intensifying. Dissent was on full display, as was the sacrifice of those serving the nation. But in Reagan’s first Loyalty Day proclamation, back in 1981, he emphasized the diversity of the country. Thirty-five years later in his final Loyalty Day proclamation, President Barack Obama similarly emphasized the nation’s diversity. NPR Librarian Katie Daugert contributed to this report.